The Public Private Partnership (PPP) Office is conducting a series of dedicated stakeholder workshops with various infrastructure related ministries and implementing agencies. The purpose of such workshops is to build awareness on PPP and to sensitize relevant officials for bringing PPP projects from their respective agencies in the national project pipeline. 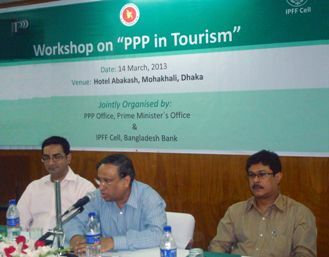 As part of this initiative, PPP Office has recently conducted a workshop with Ministry of Civil Aviation and Tourism (MoCAT) on 14 March 2013 at hotel Abakash of Bangladesh Parjatan Corporation (BPC). Bangladesh provides a unique offering and promising appeal to the local and international tourism community for its various destinations, locations and heritage. However, the lack of infrastructure and support facilities constrain the potential opportunities to fully access the diverse tourism sights and attractions in Bangladesh. To maximize the potential of tourism in Bangladesh and attract a wider segment of the national and international tourism community there is a need for significant investment to enhance existing and build new facilities. Government has recently reinvigorated the PPP initiative in Bangladesh as a way of addressing constraints in infrastructure investment in Bangladesh. In line with this strategy PPP is now being seen as an important way enhancing investment in the tourism sector. This workshop primarily focused on how PPP could be used to develop the tourism sector through the use of international case studies and open discussions. The workshop was chaired by Md. Maksudul Hasan Khan, additional secretary & Chairman, BPC. Mr. Syed Afsor H. Uddin, CEO of PPP Office and Mr. Akhtaruzzaman Khan, CEO of Bangladesh Tourism Board (BTB) were also present as special guests. In his speech, the Chairman of BPC referred to PPP as an important tool for the development of the country’s tourism sector and also mentioned the workshop as a ground breaking event for promoting tourism through PPP. He said “This event will surely help us understand PPP in detail and will assist us think forward for bringing more tourism projects under PPPs in Bangladesh”. The CEO of BTB also thanked the PPP Office for its endeavor for the workshop and quoted that “I hope that this workshop will not be a traditional workshop and I request all of my colleagues to discuss and work closely with PPP Office and Parjatan Corporation to generate ideas about potential projects”. Two presentations by the PPP office were made in the workshop. The first presentation was on the benefits and potentials of PPPs, especially different stages and processes of PPPs which was delivered by CEO of PPP Office. Moreover, the CEO informed the development and current state of PPP projects in Bangladesh. The second presentation was on case studies of PPP projects across the world which was presented by Mr. Abul Bashar, Deputy Manager of PPP Office. Finally, Mr. Kaliranjan, Director, Planning, BPC in his presentation focused mainly on existing BPC facilities and potential PPP projects for tourism sector in Bangladesh. The workshop ended with an enthusiastic and participative question answer session where queries were raised by various participants on the PPP regulatory framework, contingent situations, contract awarding, quality assurance & operation and maintenance and many others. CEO, PPP Office and Mr. Humayun Kabir, Deputy Manager of PPP Office responded to the queries and also provided feedback and clarifications in relation to international best practice.